All urine drug test devices are required to be verified according to AS4308 as per the excerpt from the standard below. You can see the certifications for our products on the accompanying tabs. 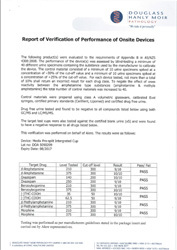 In order for on-site devices to be used, there has to be a procedure for ensuring the trueness of results with respect to the cut-offs as specified in Table 1. This is achieved by adopting an acceptable level of performance for readings within +25% and −30% of the screening cut-offs. Verification is to be performed by a laboratory accredited to AS ISO/IEC 17025 or AS 4633 and the relevant Standard, AS/NZS 4308, or equivalent. The procedure is carried out by blind-testing a minimum of 20 different urine specimens containing the substance used by the manufacturer to calibrate the device for each drug class. 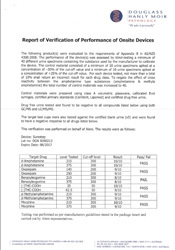 specimens at +25% of the cut-off for each drug class tested by the device. It is acceptable to spike multiple substances into each urine specimen. For each of the drug classes tested, not more than a total of 10% shall return either a positive at −30% of the cut-off and/or a negative at +25% of the cut-off. All urine drug concentrations shall be checked using mass spectrometry. Results of the verification to assess compliance of the device shall be documented and available to the requesting authority and accrediting agency. As an example, if 20 devices are tested, no more than two failures in total (either false positives or false negatives) are permitted for each drug class tested.